Other Names*: Ann Booth Dennett, Ann Booth Dennett Clopton, Ann Booth Clopton, Ann Dennett, Ann Clopton, Anne Booth Dennett, Anne Booth Dennett Clopton, Anne Booth Clopton, Anne Dennett, Anne Clopton. Note*: When she married William Clopton, she was the widow of Capt. Thomas Dennett, who died about 1673 and by whom she had four children. [S35] Gene Carlton Clopton, The Ancestors and Descendants of William Clopton of York County, Virginia (Atlanta, Ga.: Phoenix Printing, Inc., 1984), pp. 86-91, 222. [S992] National Soc'y of the Colonial Dames of America in the State of Virginia, The Parish Register of Saint Peter's, New Kent County, Va. from 1680 to 1787, above, p. 57 (spelling her name as Anne and giving the date but not the place). [S248] Supposition as to place, as her death is recorded in the register of St. Peter's Parish, New Kent County, Virginia. Marriage*: He married Frances _____ in England. Note*: He lived at Belle Ville in Gloucester County, Virginia. He was one of two physicians in early Jamestown, Virginia, and was a member of the Virginia House of Burgesses in 1653-54 and Clerk of York County, Virginia from 1640 to 1657. At his death he owned 23,000 bricks, valued at 184 shillings, and a library of at least 300 volumes. He had extensive land holdings in Charles County (later York County), Virginia. [S35] Gene Carlton Clopton, The Ancestors and Descendants of William Clopton of York County, Virginia (Atlanta, Ga.: Phoenix Printing, Inc., 1984), pp. 87 (citing Stannard's Colonial Virginia Register; York Co., Va. Records; Wm. & Mary Q. Mag., vol. XI), 222. [S36] Rose Edwards, letter to Roger Bartlett, 25 May 1994, citing Hazel Lawler, The Descendants of Steven Lacy. [S35] Gene Carlton Clopton, The Ancestors and Descendants of William Clopton of York County, Virginia (Atlanta, Ga.: Phoenix Printing, Inc., 1984), p. 91 (citing York Co., Va. Records generally and Deed Book vol. VII, p. 55). [S35] Gene Carlton Clopton, The Ancestors and Descendants of William Clopton [etc. ], above, p. 91 (stating that she was born before 1682 and citing York Co., Va. Records generally and Deed Book vol. VII, p. 55). [S678] Sandy Carneiro, electronic mail to e-mail address, 5 Sep 2001, (giving only the date). [S35] Gene Carlton Clopton, The Ancestors and Descendants of William Clopton of York County, Virginia (Atlanta, Ga.: Phoenix Printing, Inc., 1984), p. 91 (citing Tyler's Q. Hist. Mag., vol. XIV, p. 237). Birth*: She was born before 1682 in York County, Virginia. Marriage*: She married Alexander Moss after 1718. [S35] Gene Carlton Clopton, The Ancestors and Descendants of William Clopton of York County, Virginia (Atlanta, Ga.: Phoenix Printing, Inc., 1984), pp. 91-92 (citing York Co., Va. Records). [S992] National Soc'y of the Colonial Dames of America in the State of Virginia, The Parish Register of Saint Peter's, New Kent County, Va. from 1680 to 1787 (Baltimore, Md. : Genealogical Pub. Co. 1966), p. 52 (giving the date but not naming the place). [S248] Supposition as to place, as their marriage is recorded in the register of St. Peter's Parish, New Kent County, Virginia. Death*: He died on 12 September 1718. [S35] Gene Carlton Clopton, The Ancestors and Descendants of William Clopton of York County, Virginia (Atlanta, Ga.: Phoenix Printing, Inc., 1984), p. 91 (citing St. Peter's Parish Reg., New Kent Co., Va.). Marriage*: He married Elizabeth Clopton, daughter of William Clopton and Ann Booth, after 1718. Death*: He died in 1772. [S35] Gene Carlton Clopton, The Ancestors and Descendants of William Clopton of York County, Virginia (Atlanta, Ga.: Phoenix Printing, Inc., 1984), pp. 91-92 (citing Cumberland Co., Va. Records, Will Book II, p. 53). Birth*: He was born on 27 January 1683 in York County, Virginia. Marriage*: He married Sarah Scott on 18 December 1711. Marriage*: He married Mary Crump on 22 March 1720. Death*: He died on 30 December 1742 at age 59. [S35] Gene Carlton Clopton, The Ancestors and Descendants of William Clopton of York County, Virginia (Atlanta, Ga.: Phoenix Printing, Inc., 1984), pp. 91, 92 (citing Clopton bible records, Va. Archives; Land Office Records, book XII, 1724-1725, old Record, p. 434; St. Peter's Parish Reg., New Kent Co., Va.). [S992] National Soc'y of the Colonial Dames of America in the State of Virginia, The Parish Register of Saint Peter's, New Kent County, Va. from 1680 to 1787, above, p. 80 (naming Robert Clopton as her father). Birth*: He was born circa 1685 in Virginia. Death*: He died before 1733 in Virginia. Note*: He was on the staff of Governor Spottswood of Virginia and participated in the 1716 expedition to explore the newly discovered part of Virginia that lay west of the mountains, which traveled 483 miles in four weeks. By a ceremony conducted by Gov. Spottswood on Christmas Day, 1716, each explorer was made a Knight of the Golden Horseshoe. He served in the French and Indian War. [S35] Gene Carlton Clopton, The Ancestors and Descendants of William Clopton of York County, Virginia (Atlanta, Ga.: Phoenix Printing, Inc., 1984), pp. 91, 92 (citing St. Peter's Parish Reg., New Kent Co., Va., generally and p. 47; Ludwell Mss., Va. Hist. Soc'y; New Kent Co., Va. Records; Wm. & Mary Q. Mag., vol. X, p. 57; Hanover Co., Va. Records, book XIII, p. 468; Mrs. Richard I. Manning, Columbia, S.C.). [S114] Joyce Wilkinson Wallace, 9 Aug 1897 statement, above (giving the year but no other information). [S35] Gene Carlton Clopton, The Ancestors and Descendants of William Clopton of York County, Virginia (Atlanta, Ga.: Phoenix Printing, Inc., 1984), p. 99 (naming Benjamin Clopton as her father). [S851] Register of St. James Northam Parish, Goochland Co., Va., part 1, online http://ftp.rootsweb.com/pub/usgenweb/va/goochland/vitals/…, viewed 5 Jul 2003, attributing information to William and Mary College Quart. Hist. Magazine, vol. 15, no. 1 (Jul 1906), p. 36 (naming Benjamin Clopton as her father). The preface to part 1 reads in part: "This register, which was kept by Rev. William Douglas, is the property of R. Lee Traylor, Esq., of Memphis, Tennessee." [S35] Gene Carlton Clopton, The Ancestors and Descendants of William Clopton [etc. ], above, p. 99. [S851] Register of St. James Northam Parish, Goochland Co., Va., part 1, online, above, viewed 5 Jul 2003, attributing information to William and Mary College Quart. Hist. Magazine, vol. 15, no. 1 (Jul 1906), p. 36 (giving the date but not naming the place). [S852] Register of St. James Northam Parish, Goochland Co., Va., part 2, online, above, viewed 5 Jul 2003, attributing information to William and Mary College Quart. Hist. Magazine, vol. 15, no. 2 (Oct 1906), p. 114 (naming Agnes Morgan as her mother). [S852] Register of St. James Northam Parish, Goochland Co., Va., part 2, online, above, viewed 5 Jul 2003, attributing information to William and Mary College Quart. Hist. Magazine, vol. 15, no. 2 (Oct 1906), p. 114 (giving the date but not the place). [S270] Kathleen Booth Williams, comp., Marriages of Goochland County, Virginia, 1733-1815 (Baltimore, Md. : Genealogical Pub. Co., Inc., 1979), p. 76 (citing to Marriage Register, Goochland Co., Va. [Va. State Lib'y], p. 273). [S35] Gene Carlton Clopton, The Ancestors and Descendants of William Clopton [etc. ], above, p. 99 (not giving the date or place). [S272] Gale Fuller, electronic mail to Roger Bartlett, 17 Aug 1997, (naming Olive Judith Clopton as his mother). [S272] Gale Fuller, electronic mail to Roger Bartlett, 17 Aug 1997, (naming Olive Judith Clopton as her mother). [S35] Gene Carlton Clopton, The Ancestors and Descendants of William Clopton [etc. ], above, p. 99 (naming Olive Judith as her mother). [S995] R.V., electronic mail to Roger Bartlett, 21 Aug 2004 (naming Olive Judith Clopton as her mother). [S272] Gale Fuller, electronic mail to Roger Bartlett, 17 Aug 1997, (naming John Perkins as his father). [S272] Gale Fuller, electronic mail to Roger Bartlett, 17 Aug 1997, (naming Lucy Mitchell as his mother). [S272] Gale Fuller, electronic mail to Roger Bartlett, 17 Aug 1997, (naming William Perkins as his father). [S272] Gale Fuller, electronic mail to Roger Bartlett, 17 Aug 1997, (naming William Perkins as her father). [S35] Gene Carlton Clopton, The Ancestors and Descendants of William Clopton of York County, Virginia (Atlanta, Ga.: Phoenix Printing, Inc., 1984), p. 99 (indicating that William Perkins was her father). [S995] R.V., electronic mail to Roger Bartlett, 21 Aug 2004 (naming William Perkins as her father). [S35] Gene Carlton Clopton, The Ancestors and Descendants of William Clopton [etc. ], above, p. 99 (giving his name as Hudson and not giving the date or place). [S270] Kathleen Booth Williams, comp., Marriages of Goochland County, Virginia, 1733-1815 (Baltimore, Md. : Genealogical Pub. Co., Inc., 1979), p. 44 (giving his name as Hudson and citing to Marriage Register, Goochland Co., Va. [Va. State Lib'y], p. 39). [S35] Gene Carlton Clopton, The Ancestors and Descendants of William Clopton of York County, Virginia (Atlanta, Ga.: Phoenix Printing, Inc., 1984), p. 99 (giving his name as Hudson and not giving the date or place). [S851] Register of St. James Northam Parish, Goochland Co., Va., part 1, online http://ftp.rootsweb.com/pub/usgenweb/va/goochland/vitals/…, viewed 5 Jul 2003, attributing information to William and Mary College Quart. Hist. Magazine, vol. 15, no. 1 (Jul 1906), p. 34. The preface to part 1 reads in part: "This register, which was kept by Rev. William Douglas, is the property of R. Lee Traylor, Esq., of Memphis, Tennessee." [S852] Register of St. James Northam Parish, Goochland Co., Va., part 2, online http://ftp.rootsweb.com/pub/usgenweb/va/goochland/vitals/…, viewed 5 Jul 2003, attributing information to William and Mary College Quart. Hist. Magazine, vol. 15, no. 2 (Oct 1906), p. 115 (giving her name as Susannah and naming Benjamin Clopton as her father). The preface to part 1 reads in part: "This register, which was kept by Rev. William Douglas, is the property of R. Lee Traylor, Esq., of Memphis, Tennessee." [S852] Register of St. James Northam Parish, Goochland Co., Va., part 2, online, above, viewed 5 Jul 2003, attributing information to William and Mary College Quart. Hist. Magazine, vol. 15, no. 2 (Oct 1906), p. 115 (giving her name as Susannah and giving the date but not the place). [S270] Kathleen Booth Williams, comp., Marriages of Goochland County, Virginia, 1733-1815 (Baltimore, Md. : Genealogical Pub. Co., Inc., 1979), p. 41 (citing to Marriage Register, Goochland Co., Va. [Va. State Lib'y], p. 34) (giving her name as Susaa Clopton). [S270] Kathleen Booth Williams, comp., Marriages of Goochland County, Virginia, above, p. 41 (citing to Marriage Register, Goochland Co., Va. [Va. State Lib'y], p. 34) (giving her name as Susaa). [S272] Gale Fuller, electronic mail to Roger Bartlett, 17 Aug 1997, (giving 23 Jul 1760 as her birthdate). [S852] Register of St. James Northam Parish, Goochland Co., Va., part 2, online, above, viewed 5 Jul 2003, attributing information to William and Mary College Quart. Hist. Magazine, vol. 15, no. 2 (Oct 1906), p. 115 (giving her name as Susannah). [S35] Gene Carlton Clopton, The Ancestors and Descendants of William Clopton of York County, Virginia (Atlanta, Ga.: Phoenix Printing, Inc., 1984), p. 99 (not giving the date or place). Marriage*: He married Adosha Glover on 7 February 1799. [S852] Register of St. James Northam Parish, Goochland Co., Va., part 2, online http://ftp.rootsweb.com/pub/usgenweb/va/goochland/vitals/…, viewed 5 Jul 2003, attributing information to William and Mary College Quart. Hist. Magazine, vol. 15, no. 2 (Oct 1906), p. 116 (giving his name as Ben Michaux Clopton and naming Benjamin Clopton as his father). The preface to part 1 reads in part: "This register, which was kept by Rev. William Douglas, is the property of R. Lee Traylor, Esq., of Memphis, Tennessee." [S852] Register of St. James Northam Parish, Goochland Co., Va., part 2, online, above, viewed 5 Jul 2003, attributing information to William and Mary College Quart. Hist. Magazine, vol. 15, no. 2 (Oct 1906), p. 116 (giving his name as Ben Michaux Clopton and giving the date but not the place). [S852] Register of St. James Northam Parish, Goochland Co., Va., part 2, online http://ftp.rootsweb.com/pub/usgenweb/va/goochland/vitals/…, viewed 5 Jul 2003, attributing information to William and Mary College Quart. Hist. Magazine, vol. 15, no. 2 (Oct 1906), p. 118 (naming Ben. Clopton as his father). The preface to part 1 reads in part: "This register, which was kept by Rev. William Douglas, is the property of R. Lee Traylor, Esq., of Memphis, Tennessee." [S1533] Milton Web Site, above, (naming Agnes Morgan as his mother). [S852] Register of St. James Northam Parish, Goochland Co., Va., part 2, online, above, viewed 5 Jul 2003, attributing information to William and Mary College Quart. Hist. Magazine, vol. 15, no. 2 (Oct 1906), p. 118 (giving the date but not the place). [S961] Find A Grave, online at http://www.findagrave.com, memorial for Anthony Clopton, memorial no. 15663871, viewed on 21 Dec 2018. [S245] Byron Sistler and Barbara Sistler, comps., Early Middle Tennessee Marriages (Nashville, Tenn.: Byron Sistler & Associates, Inc., 1988), vol. 1, Grooms, p. 106 (giving her name as Rhoady Hoggett). [S961] Find A Grave, online, above, memorial for Rhoda Hoggatt Clopton, memorial no. 15663881, viewed on 21 Dec 2018 (stating that they married in 1804 with no further information). [S961] Find A Grave, online, above, memorial for Anthony Clopton, memorial no. 15663871, viewed on 21 Dec 2018 (stating that they married in 1804 with no further information). [S35] Gene Carlton Clopton, The Ancestors and Descendants of William Clopton [etc. ], above, pp. 105-6 (naming Anthony Clopton as his father). [S35] Gene Carlton Clopton, The Ancestors and Descendants of William Clopton [etc. ], above, pp. 105-6, 118 (naming Anthony Clopton as his father). [S961] Find A Grave, online, above, memorial for Benjamin Michaux Clopton, memorial no. 58845024, viewed on 21 Dec 2018 (naming Anthony Clopton as his father). [S35] Gene Carlton Clopton, The Ancestors and Descendants of William Clopton [etc. ], above, pp. 105-6, 118 (naming Anthony Clopton as her father). [S35] Gene Carlton Clopton, The Ancestors and Descendants of William Clopton [etc. ], above, pp. 105-6 (naming Anthony Clopton as her father). [S35] Gene Carlton Clopton, The Ancestors and Descendants of William Clopton [etc. ], above, pp. 105-6, 120 (naming Anthony Clopton as his father). [S35] Gene Carlton Clopton, The Ancestors and Descendants of William Clopton [etc. ], above, pp. 105-6, 120 (naming Anthony Clopton as her father). Marriage*: He married Jane Cary, daughter of Archibald Cary. [S35] Gene Carlton Clopton, The Ancestors and Descendants of William Clopton of York County, Virginia (Atlanta, Ga.: Phoenix Printing, Inc., 1984), p. 105 (naming Thomas E. Randolph as her father). Marriage*: She married Thomas E. Randolph. Other Names*: Jane Carey, Jane Cary Randolph, Jane Carey Randolph, Jane Randolph. [S1099] Wikipedia Online Encyclopedia http://en.wikipedia.org/wiki/Main_Page, s.v. "Archibald Cary," viewed on 12 Aug 2016 (naming Archibald Cary as her father). [S35] Gene Carlton Clopton, The Ancestors and Descendants of William Clopton of York County, Virginia (Atlanta, Ga.: Phoenix Printing, Inc., 1984), p. 105 (naming Jane Carey as her mother). Other Names*: Rhoda Hoggatt Clopton, Rhoda Clopton. • Her Find A Grave memorial, which includes a picture of her cenotaph, is here. [S961] Find A Grave, online at http://www.findagrave.com, memorial for Rhoda Hoggatt Clopton, memorial no. 15663881, viewed on 21 Dec 2018. [S35] Gene Carlton Clopton, The Ancestors and Descendants of William Clopton of York County, Virginia (Atlanta, Ga.: Phoenix Printing, Inc., 1984), pp. 105-6 (naming Rhoda Hoggatt as his mother). [S35] Gene Carlton Clopton, The Ancestors and Descendants of William Clopton [etc. ], above, pp. 105-6 (naming Rhoda Hoggatt as her mother). Birth*: He was born in 1809 in Tennessee. [S35] Gene Carlton Clopton, The Ancestors and Descendants of William Clopton of York County, Virginia (Atlanta, Ga.: Phoenix Printing, Inc., 1984), p. 105. [S207] Thomas E. Partlow, comp., Wilson County, Tennessee, Wills: Books 1-13, 1802-1850 (Easley, S.C.: Southern Historical Press, 1981), p. 106 (stating that will of Walter Clopton, Sr. names John A. Clopton as an heir and son). [S207] Thomas E. Partlow, comp., Wilson County, Tennessee, Wills, above, pp. 106 (stating that will of Walter Clopton, Sr. names Eleanor Clopton as Walter's wife and John A. Clopton as an heir and son), 108 (stating that will of Eleanor Clopton names John A. Clopton as an heir and son). [S209] Edythe Rucker Whitley, comp., Marriages of Wilson County, Tennessee, 1802-1850 (Baltimore, Md. : Genealogical Pub. Co., 1981), p. 109. [S245] Byron Sistler and Barbara Sistler, comps., Early Middle Tennessee Marriages (Nashville, Tenn.: Byron Sistler & Associates, Inc., 1988), vol. 1, Grooms, p. 106. [S14] "Descendants of Joseph Callaway of Virginia," above, p. 76 (naming Elizabeth Hopkins as her mother). [S724] Descendants of Joseph and Peter Callaway, above, p. 6 (naming Elizabeth Hopkins as her mother). [S714] Mary P. Funkhouser, "A Callaway Tour of Bedford County [Virginia]," The Callaway Journal, vol. 4, p. 18 (1979), p. 25 (citing grave marker). [S714] Mary P. Funkhouser, "A Callaway Tour of Bedford County [Virginia]," The Callaway Journal, above, p. 25 (not giving the date and stating that her grave marker gives her name as Anna and identifies her as "wife of Col. Wm. Callaway"). [S714] Mary P. Funkhouser, "A Callaway Tour of Bedford County [Virginia]," The Callaway Journal, above, p. 25 (citing grave marker and stating that the year may be 1835). [S714] Mary P. Funkhouser, "A Callaway Tour of Bedford County [Virginia]," The Callaway Journal, above, p. 25. [S724] Descendants of Joseph and Peter Callaway, above, p. 6 (naming Ann Bowker Smith as her mother). [S724] Descendants of Joseph and Peter Callaway, above, p. 6 (naming Ann Bowker Smith as this child's mother). [S724] Descendants of Joseph and Peter Callaway, above, p. 6 (naming Ann Bowker Smith as his mother). Death*: He died circa 1864. Note*: In the Civil War he was wounded in the Battle of the Wilderness and the Battle of Chickamauga and died of his wounds. [S35] Gene Carlton Clopton, The Ancestors and Descendants of William Clopton of York County, Virginia (Atlanta, Ga.: Phoenix Printing, Inc., 1984), p. 117. [S35] Gene Carlton Clopton, The Ancestors and Descendants of William Clopton [etc. ], above, p. 117 (naming Walter Clopton, Jr. as his father). [S35] Gene Carlton Clopton, The Ancestors and Descendants of William Clopton [etc. ], above, p. 117 (naming Walter Clopton, Jr.'s first wife, whose name is now known, as his mother). 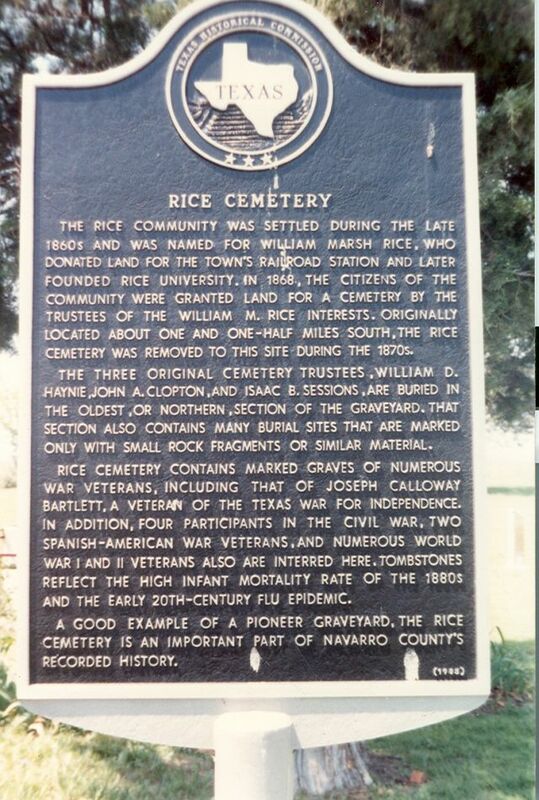 Texas state historical marker, Rice Cemetery, Rice, Tex., mentioning J. A. Clopton. Click on image to enlarge it. Scrapbook*: "Have Been Married Fifty Years. “J. A. Clopton, age 91 years, died at the home of his daughter Mrs. A. J. McKnight in Hillsboro Thursday, December 14, and was buried the following day with Masonic honors at Rice. The funeral was conducted by the Rev. Mr. Day, pastor of the Baptist church of that city. “The deceased was born in Virginia moving to Tennessee when yet a young man, later moving with his family to Texas, arriving at Rice on February 19, 1874, where he lived until the death of his wife. Since the death of his wife he has lived with his daughter, Mrs. A. J. McKnight of Hillsboro, spending a part of his time with his other children and visiting his old home in Tennessee. [S94] Mrs. John Bowden, "First Baptist Church," in Navarro County History, vol. 2 (Corsicana, Tex. : The Navarro County Hist. Soc'y, 1978), p. 383. [S35] Gene Carlton Clopton, The Ancestors and Descendants of William Clopton of York County, Virginia (Atlanta, Ga.: Phoenix Printing, Inc., 1984), p. 117 (naming Walter Clopton, Jr. as his father). [S335] Kathy Wilcox, computer files sent to Roger Bartlett, 25 Nov 1997 (naming Walter Clopton as his father). [S35] Gene Carlton Clopton, The Ancestors and Descendants of William Clopton [etc. ], above, p. 132 (stating that he was born in Wilson County, Tennessee but giving the date as 4 Jul 1830). [S335] Kathy Wilcox, computer files sent to Roger Bartlett, 25 Nov 1997 (stating that he was born in Wilson County, Tennessee but giving the date as 4 Jul 1830). [S67] The Dallas Morning News, Dallas, Tex., 27 Sep 1901, p. 7 (not giving the date but stating that he was seventy years old when they celebrated their fiftieth wedding anniversary in Sep 1901). [S35] Gene Carlton Clopton, The Ancestors and Descendants of William Clopton [etc. ], above, p. 132. [S208] Edythe Rucker Whitley, comp., Marriages of Rutherford County, Tennessee, 1804-1872 (Baltimore, Md. : Genealogical Pub. Co., 1981), p. 126. [S335] Kathy Wilcox, computer files sent to Roger Bartlett, 25 Nov 1997 (not giving the city). [S67] The Dallas Morning News, Dallas, Tex., 27 Sep 1901, p. 7 (not giving the date or place but stating they had celebrated their fiftieth wedding anniversary). [S11] Index to Texas Death Records (Austin, Tex. : Tex. Dept. of Health, Bur. of Vital Statistics), typescript, 1903-40, vol. 10, p. 4793, file 34861. [S9] Grave marker, Rice Cemetery, Rice, Tex. (common marker with Lucy W. Clopton). [S440] Navarro County Cemetery Records, vol. 4, above, p. 84 (common marker with Lucy W. Clopton). [S67] The Dallas Morning News, Dallas, Tex., 27 Sep 1901, p. 7. [S1207] Corsicana Daily Sun, Corsicana, Tex., online archive at http://corsicana.newspaperarchive.com, 19 Dec 1922, p. 1, col. 3. [S165] Mrs. M. S. Miles and Mrs. S. A. Moore, "A History of Rice," in Navarro County Scroll, 1967, pp. 46-47. [S335] Kathy Wilcox, computer files sent to Roger Bartlett, 25 Nov 1997 (giving 4 Jul 1830 as his birth date). [S35] Gene Carlton Clopton, The Ancestors and Descendants of William Clopton [etc. ], above, p. 132 (giving 4 Jul 1830 as his birth date). [S35] Gene Carlton Clopton, The Ancestors and Descendants of William Clopton [etc. ], above, p. 132 (naming John Anthony Clopton as his father). [S204] Records of Bank Sutherland Funeral Home (later McCammon Funeral Home), Corsicana, Texas, in Navarro Leaves and Branches, vol. VI, no. 1 (Feb 1983), p. 10 (naming John Clopton, born in Tennessee, as his father). [S330] Ellis A. Davis and Edwin H. Grobe, comps. and eds., The Encyclopedia of Texas (Dallas, Tex. : n.pub., n.d. [ca. 1922]), p. 267 (naming J. A. Clopton as his father). [S35] Gene Carlton Clopton, The Ancestors and Descendants of William Clopton [etc. ], above, p. 132 (naming John Anthony Clopton as her father). Birth*: She was born in Tennessee. [S35] Gene Carlton Clopton, The Ancestors and Descendants of William Clopton of York County, Virginia (Atlanta, Ga.: Phoenix Printing, Inc., 1984), p. 117 (not giving her name and naming Walter Clopton, Jr. as her father). [S35] Gene Carlton Clopton, The Ancestors and Descendants of William Clopton of York County, Virginia (Atlanta, Ga.: Phoenix Printing, Inc., 1984), p. 117 (naming Walter Clopton, Jr. as her father). [S67] The Dallas Morning News, Dallas, Tex., 27 Sep 1901, p. 7 (not giving the date but stating that she was sixty-five years old when they celebrated their fiftieth wedding anniversary in Sep 1901). [S9] Grave marker, Rice Cemetery, Rice, Tex. (common marker with J. A. Clopton). [S440] Navarro County Cemetery Records, vol. 4, above, p. 84 (common marker with J. A. Clopton). [S35] Gene Carlton Clopton, The Ancestors and Descendants of William Clopton [etc. ], above, p. 132 (indicating that Lucy Wade Martin was his mother). [S204] Records of Bank Sutherland Funeral Home (later McCammon Funeral Home), Corsicana, Texas, in Navarro Leaves and Branches, vol. VI, no. 1 (Feb 1983), p. 10 (naming Lucy Martin, born in Tennessee, as his mother). [S330] Ellis A. Davis and Edwin H. Grobe, comps. and eds., The Encyclopedia of Texas (Dallas, Tex. : n.pub., n.d. [ca. 1922]), p. 267 (naming Lucy Wade Clopton as his mother). [S35] Gene Carlton Clopton, The Ancestors and Descendants of William Clopton [etc. ], above, p. 132 (indicating that Lucy Wade Martin was her mother). [S35] Gene Carlton Clopton, The Ancestors and Descendants of William Clopton of York County, Virginia (Atlanta, Ga.: Phoenix Printing, Inc., 1984), p. 132 (naming John Anthony Clopton as his father). 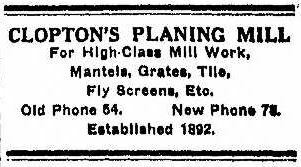 1916 newspaper advertisement for Clopton Planing Mill, Corsicana Daily Sun, Corsicana, Tex. Scrapbook*: "B. M. CLOPTON, owner of the Clopton Planing Mills, 213 East Fourth Avenue [in Corsicana], in establishing the Clopton Mills thirty years ago erected one of the commercial strongholds that has helped to increase the wealth and population of Navarro County. "This concern was organized in 1892 under the joint ownership of Clopton and Bragg, but was later bought out by Mr. Clopton who owned the business alone until some years later when Mr. Charles Hagins purchased a partnership. The mill turns out every kind of novelty mill work including sash, doors, windows, built-in cabinets, and various other built-in features. All ornamental work and inside fixtures of the Palace and Grand Theaters were done by this concern. "A native of Murfreesboro, Tennessee, and the son of J. A. and Lucy Wade Clopton, Mr. Clopton came to Texas with his parents February 19, 1874, when he was nineteen years of age. The family settled in Navarro County where a farm was purchased, and Mr. Clopton spent the first year of his life in Texas plowing his father's land with a team of oxen. By the end of that year, however, he determined to follow his own trade as contractor and came to Corsicana to establish himself in business. He continued in the contracting business until 1892 when he opened the Clopton Planing Mills. "In 1884 he erected a home for himself and family at 521 North Beaton Street and he is still living there. He has a son, Sam H. Clopton of Beaumont, and one daughter, Mrs. A. P. Simpson of Corsicana, whose son Donald Simpson is Mr. Clopton's only grandchild. “The death of Mr. B. M. Clopton, one of Corsicana’s valued citizens, which occurred Saturday morning about 10 o’clock at the home of his daughter, Mrs. A. P. Simpson, has brought sadness to the hearts of his large concourse of friends, who extend deepest sympathy to the heart-broken loved ones left to mourn his loss. The funeral took place this afternoon from the First Christian church at 3:30 with burial in Oakwood. [S204] Records of Bank Sutherland Funeral Home, above, in Navarro Leaves and Branches, vol. VI, no. 1 (Feb 1983), p. 10 (naming Lucy Martin, born in Tennessee, as his mother). [S330] Ellis A. Davis and Edwin H. Grobe, comps. and eds., The Encyclopedia of Texas, above, p. 267 (naming Lucy Wade Clopton as his mother). [S189] Navarro County Cemetery Records, vol. 9 (Corsicana, Tex. : The Navarro County Gen. Soc'y, 1989), p. 156 (giving only the year and not naming the place). [S204] Records of Bank Sutherland Funeral Home, above, in Navarro Leaves and Branches, vol. VI, no. 1 (Feb 1983), p. 10. [S35] Gene Carlton Clopton, The Ancestors and Descendants of William Clopton [etc. ], above, p. 132 (giving the date but not the place). [S67] The Dallas Morning News, Dallas, Tex., 12 Apr 1926, part 2, p. 7 (not giving the date or place but stating that he was seventy-one years old when he died on 11 Apr 1926). [S1076] 1900 U.S. Census, Navarro County, Tex., sheet 13A, line 18 (stating that he was born in Oct 1854 in Tennessee). [S7] Navarro County, Texas Marriages, vol. 1, 1846-1888 (Corsicana, Tex. : The Navarro County Gen. Soc'y, 1987), p. 66 (citing Navarro County, Texas Marriage Records, vol. IV, p. 133). [S35] Gene Carlton Clopton, The Ancestors and Descendants of William Clopton [etc. ], above, p. 132 (giving only the date). [S15] Navarro County, Texas Marriages, vol. 2, 1889-1899 (Corsicana, Tex. : The Navarro County Gen. Soc'y, 1987), p. 195 (citing Navarro County, Texas Marriage Records, vol. XI, p. 187) (giving their names as B. M. Clopton, Jr. and Mrs. Josephine Collier) (giving the date and county but not the city). [S11] Index to Texas Death Records (Austin, Tex. : Tex. Dept. of Health, Bur. of Vital Statistics), typescript, 1903-40, vol. 10, p. 4793, file 15406 (giving his name as Ben Clopton) (giving the date and county but not the city). [S67] The Dallas Morning News, Dallas, Tex., 12 Apr 1926, part 2, p. 7. [S1207] Corsicana Daily Sun, Corsicana, Tex., online archive at http://corsicana.newspaperarchive.com, 12 Apr 1926, p. 15, col. 3 (reprinted here with consent of the Corsicana Daily Sun) (stating that he died Saturday morning, April 10, which apparently is incorrect, at his daughter's home). [S189] Navarro County Cemetery Records, vol. 9, above, p. 156 (naming the place but not giving the date). [S1207] Corsicana Daily Sun, Corsicana, Tex., online archive, above, 12 Apr 1926, p. 15, col. 3 (obituary of B. M. Clopton). [S330] Ellis A. Davis and Edwin H. Grobe, comps. and eds., The Encyclopedia of Texas, above, p. 267. [S1207] Corsicana Daily Sun, Corsicana, Tex., online archive, above, 12 Apr 1926, p. 15, col. 3 (reprinted here with consent of the Corsicana Daily Sun). [S330] Ellis A. Davis and Edwin H. Grobe, comps. and eds., The Encyclopedia of Texas, above, p. 267 (giving all information except his survivors). [S67] The Dallas Morning News, Dallas, Tex., 12 Apr 1926, part 2, p. 7 (describing his survivors). [S35] Gene Carlton Clopton, The Ancestors and Descendants of William Clopton of York County, Virginia (Atlanta, Ga.: Phoenix Printing, Inc., 1984), p. 132 (giving only the date). [S189] Navarro County Cemetery Records, vol. 9, above, p. 156 (giving her name as Lizzie Viola Clopton). Samuel Walter Clopton's tombstone, Myrtle Cemetery, Ennis, Tex., courtesy of Carol Cox. "Side Rod Breaks and Is Hurled Through Cab. "Ennis, Tex., May 16 .—As the passenger train on the Fort Worth branch of the Central was coming from Fort Worth today, at a point two miles west of Kennedale, the side rod on the right side of the engine broke and was hurled with tremendous force against the cab, tearing away timbers and irons. Engineer Sam Clopton was hurled from his seat against the top and sides of the cab and is said to be seriously hurt. He was brought to his home here for treatment." “ATTEMPT MADE TO WRECK H. & T. C. TRAIN. “Plano, Texas, Dec. 30 —An attempt was made early Friday morning to wreck the northbound Houston & Texas Central passenger train No. 19, two miles north of Plano. A crosstie was discovered placed across the tracks at this point by Sam Clopton, engineer. The train was stopped barely in time to avoid a wreck. Twenty minutes was lost in removing the crosstie. [S277] Ellis County, Texas, Cemetery Records, vol. 9 (Waxahachie, Tex. : Ellis County Gen. Soc'y, 1986), p. 119. 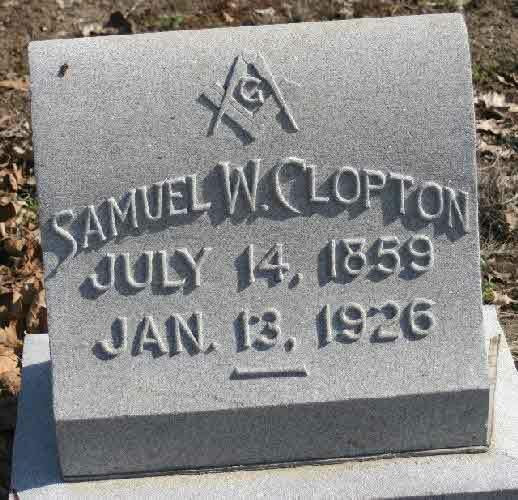 [S961] Find A Grave, online at http://www.findagrave.com, memorial for Samuel W. Clopton, memorial no. 44940899. [S7] Navarro County, Texas Marriages, vol. 1, 1846-1888 (Corsicana, Tex. : The Navarro County Gen. Soc'y, 1987), p. 84 (citing Navarro County, Texas Marriage Records, vol. V, p. 33). [S67] The Dallas Morning News, Dallas, Tex., 1 Oct 1929, part 1, p. 2 ("Former Ennis Woman Dies") (not giving the date or place). [S67] The Dallas Morning News, Dallas, Tex., 17 May 1906, p. 17 (first item). [S1299] Dallas Morning News, Dallas, Tex., online archive at http://www.genealogybank.com/gbnk/newspapers/, 31 Dec 1921, p. 11 (second item). [S67] The Dallas Morning News, Dallas, Tex., 1 Oct 1929, part 1, p. 2 ("Former Ennis Woman Dies") (stating that for many years he was a railroad engineer out of Ennis, Texas). Idaho Church Clopton's tombstone, Myrtle Cemetery, Ennis, Tex., courtesy of Carol Cox. Other Names*: Ida Church, Idaho Church Clopton, Idaho Clopton, Ida Clopton. 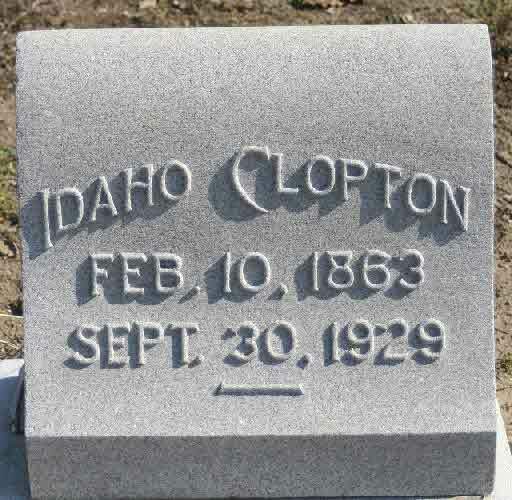 [S961] Find A Grave, online at http://www.findagrave.com, memorial for Idaho Clopton, memorial no. 44940917. [S277] Ellis County, Texas, Cemetery Records, vol. 9, above, p. 119 (giving the date but not the place). [S67] The Dallas Morning News, Dallas, Tex., 1 Oct 1929, part 1, p. 2 ("Former Ennis Woman Dies"). [S961] Find A Grave, online, above, memorial for Idaho Clopton, memorial no. 44940917 (giving the date but no other information). [S277] Ellis County, Texas, Cemetery Records, vol. 9, above, p. 119 (naming the place but not giving the date of burial). [S67] The Dallas Morning News, Dallas, Tex., 1 Oct 1929, part 1, p. 2 ("Former Ennis Woman Dies") (stating that she would be buried in Ennis, Texas on 2 Oct 1929 without naming the cemetery). [S961] Find A Grave, online, above, memorial for Idaho Clopton, memorial no. 44940917 (not giving the date). [S624] Thelma Cooper, electronic mail to Roger Bartlett, 10 Jun 2001, (citing 1900 U.S. Census, Ellis Co., Tex., for birthdate). [S67] The Dallas Morning News, Dallas, Tex., 29 Aug 1910, p. 2 (obituary of Miss Eugenia Clopton). [S67] The Dallas Morning News, Dallas, Tex., 1 Oct 1929, part 1, p. 2 (obituary of Mrs. S. W. Clopton). [S440] Navarro County Cemetery Records, vol. 4 (Corsicana, Tex. : The Navarro County Gen. Soc'y, 1985), p. 84 (naming Ida Clopton as his mother). [S35] Gene Carlton Clopton, The Ancestors and Descendants of William Clopton of York County, Virginia (Atlanta, Ga.: Phoenix Printing, Inc., 1984), p. 132 (naming John Anthony Clopton as her father). “UNUSUAL ACCIDENT ON THE FORT WORTH & DENVER RAILWAY NEAR ELECTRA. “Wichita Falls, Texas, March 22 .—Two men were instantly killed and a third perhaps fatally injured at noon today when an engine on the Fort Worth & Denver Railroad exploded two miles north of Electra [Texas]. The entire top of the cab was blown off, but the locomotive did not leave the rails, although the train was going at a rate of fifteen miles an hour when the accident occurred. “J. R. Clopton, engineer, was perhaps fatally injured. “All resided in Wichita Falls. “Engineer Clopton is one of the oldest men in the service of the Fort Worth & Denver, having been on the payroll of the company continuously for the last twenty-eight years. “Both the dead and injured were brought to this city in a caboose. “The accident is said to have been due to a stuck safety valve. The engine, No. 57, had originally belonged to the Trinity & Brazos Valley, but under the pooling plan covering equipment of all lines had been in this territory for the last week. Obituary*: “THIRD VICTIM OF BOILER EXPLOSION DIES OF INJURY. [S1076] 1900 U.S. Census, Donley County, Tex., City of Clarendon, sheet 7A, line 26 (stating that he was born in Sep 1865 in Tennessee). [S961] Find A Grave, online at http://www.findagrave.com, memorial for J. R. Clopton, memorial no. 22512980, viewed on 12 Apr 2014 (giving the year but no other information). [S35] Gene Carlton Clopton, The Ancestors and Descendants of William Clopton [etc. ], above, p. 132 (giving the year but no other information). [S1298] Fort Worth Star-Telegram, Fort Worth, Tex., online archive at http://www.genealogybank.com/gbnk/newspapers/, 24 Mar 1918, p. 37 (notice stating that masonic lodge would conduct funeral that afternoon, suggesting death had occurred within a few days previously; place of death not given). [S1299] Dallas Morning News, Dallas, Tex., online archive at http://www.genealogybank.com/gbnk/newspapers/, 24 Mar 1918, sec. 4, p. 2, col. 7 (stating, in an article dated 23 Mar 1918, that he died "late last night" in a Wichita Falls, Texas hospital). [S961] Find A Grave, online, above, memorial for J. R. Clopton, memorial no. 22512980, viewed on 12 Apr 2014 (not giving the date). [S1298] Fort Worth Star-Telegram, Fort Worth, Tex., online archive, above, 24 Mar 1918, p. 37 (notice stating that masonic lodge would conduct funeral that afternoon). [S1299] Dallas Morning News, Dallas, Tex., online archive, above, 23 Mar 1918, p. 1, col. 2. [S1299] Dallas Morning News, Dallas, Tex., online archive, above, 24 Mar 1918, sec. 4, p. 2, col. 7. [S1076] 1900 U.S. Census, Donley County, Tex., City of Clarendon, sheet 7A, line 26. [S1074] 1880 U.S. Census, Navarro County, Tex., p. 7, line 1. [S1076] 1900 U.S. Census, Donley County, Tex., City of Clarendon, sheet 7A, line 31 (stating that she was born in Jul 1868 in Tennessee). [S11] Index to Texas Death Records (Austin, Tex. : Tex. Dept. of Health, Bur. of Vital Statistics), typescript, 1903-40, vol. 35, p. 17143, file 19189 (giving her name as Lizzie Belle). HILLSBORO, Dec. 31.—Mrs. Angelina Hester McKnight, aged 64 years, died at her home here Sunday morning [29 Dec 1935] after an extended illness. 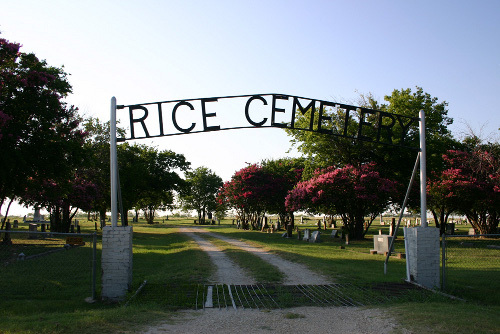 The funeral services were conducted Monday afternoon with burial in Rice, Navarro county. [S1207] Corsicana Daily Sun, Corsicana, Tex., online archive at http://corsicana.newspaperarchive.com, 31 Dec 1935, p. 9, col. 4 (obituary of Mrs. Angelina Hester McKnight) (not giving the date but stating that she was sixty-four years old when she died on 29 Dec 1935). [S11] Index to Texas Death Records (Austin, Tex. : Tex. Dept. of Health, Bur. of Vital Statistics), typescript, 1903-40, vol. 32, p. 15935, file 57437 (giving her name as Angeline Hester) (giving the date and county). [S440] Navarro County Cemetery Records, vol. 4, above, p. 84 (giving the date but not the place). [S1207] Corsicana Daily Sun, Corsicana, Tex., online archive, above, 31 Dec 1935, p. 9, col. 4 (obituary of Mrs. Angelina Hester McKnight) (stating that she died in her home on Sunday morning after a long illness). [S9] Grave marker, Rice Cemetery, Rice, Tex. (common marker with Alex J. McKnight) (not giving the date). [S440] Navarro County Cemetery Records, vol. 4, above, p. 84 (common marker with Alex J. McKnight) (not giving the date). [S1207] Corsicana Daily Sun, Corsicana, Tex., online archive, above, 31 Dec 1935, p. 9, col. 4 (obituary of Mrs. Angelina Hester McKnight). [S1207] Corsicana Daily Sun, Corsicana, Tex., online archive, above, 31 Dec 1935, p. 9, col. 4. Note*: • From the Rice Rustler, 6 Apr 1906: "T. S. Clopton, who has been night ticket agent for the Cotton Belt at Mt. Pleasant for some time, was here Wednesday evening en route to Amarillo. Tom has accepted a day job and a much better position with the road at that place. We are glad to see the promotion." • In 1938 he was living in Topeka, Kansas and working for the Atchison, Topeka & Santa Fe R.R. Co.
[S35] Gene Carlton Clopton, The Ancestors and Descendants of William Clopton [etc. ], above, p. 154. [S1027] Jim Shepherd, electronic mail to e-mail address, 25 Jun 2005, (spelling his middle name as Steel). [S961] Find A Grave, online at http://www.findagrave.com, memorial for Thomas Steele Clopton, memorial no. 16359447, viewed on 9 Mar 2014 (giving the date but not the place). [S499] Austin Statesman, Austin, Tex., 18 Jul 1921, p. 4, col. 3 (obituary of Mrs. Mary W. Clopton, stating that she was the wife of T. E. Clopton but not giving the date or place). [S961] Find A Grave, online, above, memorial for Thomas Steele Clopton, memorial no. 16359447, viewed on 9 Mar 2014 (not giving the date or place). [S961] Find A Grave, online, above, memorial for Mary W. Browning Clopton, memorial no. 16359453, viewed on 9 Mar 2014 (not giving the date or place). [S961] Find A Grave, online, above, memorial for Thomas Steele Clopton, memorial no. 16359447, viewed on 9 Mar 2014. [S18] Rice Rustler, Rice, Tex., 6 Apr 1906 (first bullet). [S504] Chante Bryant, 17 Sep 1999 letter, above, (third bullet). Note*: The 1880 census for Navarro County, Texas describes him as "crippled, bedridden, or otherwise disabled." Other Names*: Mary Browning Clopton, Mary Webster Clopton, Mary Clopton. Obituary*: "MRS. MARY W. CLOPTON. [S499] Austin Statesman, Austin, Tex., 18 Jul 1921, p. 4, col. 3 (obituary of Mrs. Mary W. Clopton, stating that she was thirty-four years old when she died on 16 Jul 1921). [S961] Find A Grave, online at http://www.findagrave.com, memorial for Thomas Steele Clopton, memorial no. 16359447, viewed on 9 Mar 2014 (not giving the date or place). [S11] Index to Texas Death Records (Austin, Tex. : Tex. Dept. of Health, Bur. of Vital Statistics), typescript, 1903-40, vol. 10, p. 4793, file 20894 (naming the county but not the town). [S499] Austin Statesman, Austin, Tex., 18 Jul 1921, p. 4, col. 3 (obituary of Mrs. Mary W. Clopton). [S961] Find A Grave, online, above, memorial for Mary W. Browning Clopton, memorial no. 16359453, viewed on 9 Mar 2014 (giving the date but not the place). [S499] Austin Statesman, Austin, Tex., 18 Jul 1921, p. 4, col. 3 (obituary of Mrs. Mary W. Clopton) (giving the city but no other information). [S961] Find A Grave, online, above, memorial for Mary W. Browning Clopton, memorial no. 16359453, viewed on 9 Mar 2014. [S499] Austin Statesman, Austin, Tex., 18 Jul 1921, p. 4, col. 3. 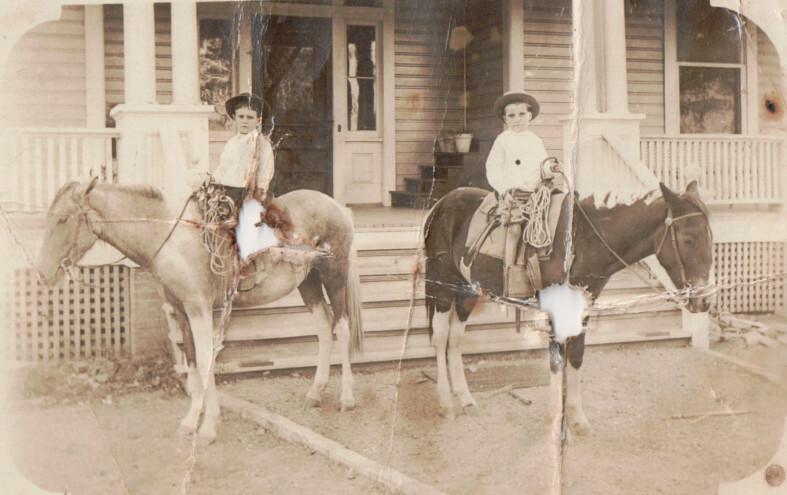 Bartlett Smith (right) and his first cousin, J. M. Bartlett, in front of their Bartlett grandparents' home in Rice, Texas, courtesy of Ann Dilworth Cavender. Note*: He was an accountant and was known as Bartlett Smith. [S58] Index to Texas Birth Records (Austin, Tex. : Tex. Dept. of Health, Bur. of Vital Statistics), typescript 1903-09, vol. 6, p. 2506, file 112478. [S190] Navarro County Cemetery Records, vol. 10 (Corsicana, Tex. : The Navarro County Gen. Soc'y, 1990), p. 120 (giving only the date). [S961] Find A Grave, online at http://www.findagrave.com, memorial for William Bartlett Smith, memorial no. 140302847, viewed on 6 Sep 2015 (giving the date but not the place). [S2] Holy Bible (1873), originally owned by J. M. Bartlett and Mollie Clopton, above (giving his name as Bartlett Smith and giving only the date). [S2] Holy Bible (1873), originally owned by J. M. Bartlett and Mollie Clopton, above (giving his name as W. Bartlett Smith) (date only). [S11] Index to Texas Death Records (Austin, Tex. : Tex. Dept. of Health, Bur. of Vital Statistics), typescript, 1973, vol. 4, p. 1568, file 20900. [S312] Social Security Death Index, online at http://tinyurl.com/AncestrySSDI, viewed on 6 Apr 1998 (stating that he died in Mar 1973; not naming the place of death but stating that he lived in Houston, Texas when he died). [S190] Navarro County Cemetery Records, vol. 10, above, p. 120. [S961] Find A Grave, online, above, memorial for William Bartlett Smith, memorial no. 140302847, viewed on 6 Sep 2015. [S468] Janette Dilworth, letter to Roger Bartlett, 17 May 1973 (naming Bartlett Smith as his father). 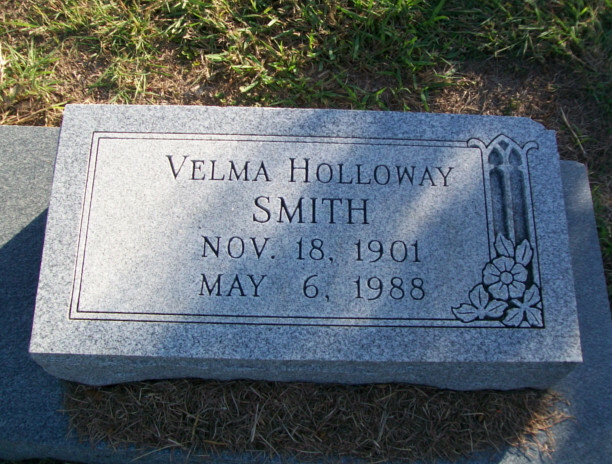 Velma Holloway Smith's tombstone, Oakwood Cemetery, Corsicana, Texas, courtesy of Eva Whearley. Photograph of tombstone for Velma Holloway Smith, Oakwood Cemetery, Corsicana, Texas, by Eva Whearley. Copied 9/6/15 from Find A Grave. Other Names*: Velma Holloway Smith, Velma Smith. [S190] Navarro County Cemetery Records, vol. 10 (Corsicana, Tex. : The Navarro County Gen. Soc'y, 1990), p. 120 (date only). [S961] Find A Grave, online at http://www.findagrave.com, memorial for Velma Holloway Smith, memorial no. 140302929, viewed on 6 Sep 2015 (giving the date but not the place). [S2] Holy Bible (1873) (giving his name as Bartlett Smith and giving only the date). This bible was originally owned by J. M. Bartlett and Mollie Clopton and was in the possession of Ruby Lynn Shelton, Rice, Tex., when viewed by Roger Bartlett in 1974. [S11] Index to Texas Death Records (Austin, Tex. : Tex. Dept. of Health, Bur. of Vital Statistics), typescript, 1988 (microfiche), p. 1910, file 43905-88 (giving her middle name as Holloway). [S190] Navarro County Cemetery Records, vol. 10, above, p. 120 (giving only the date). [S312] Social Security Death Index, online at http://tinyurl.com/AncestrySSDI, viewed on 16 Mar 1998 (not naming the place of death but stating that she lived in Houston, Texas when she died). [S961] Find A Grave, online, above, memorial for Velma Holloway Smith, memorial no. 140302929, viewed on 6 Sep 2015. [S779] "Nearly One Thousand Have Graduated from Corsicana High School Since 1884," Corsicana Daily Sun, Corsicana, Tex., 10 May 1923, as reprinted in Navarro Leaves & Branches, vol. XXV, no. III (Aug 2002), p. 6. [S468] Janette Dilworth, letter to Roger Bartlett, 17 May 1973 (naming Velma Holloway as his mother). Charles Randolph Smith's tombstone, Forest Park Westheimer Cemetery, Houston, Tex., courtesy of Gale Green Brister. 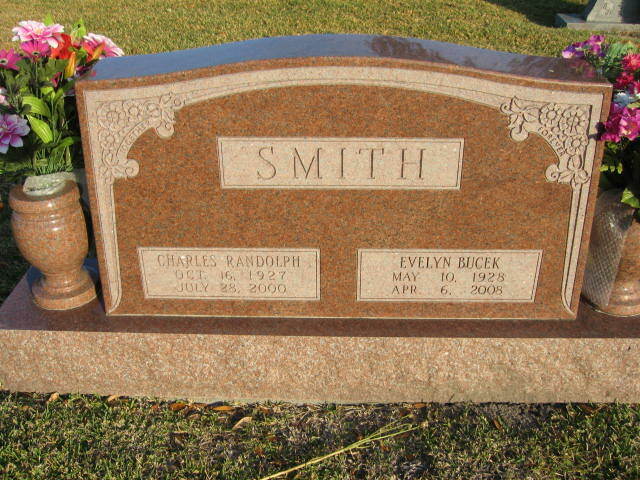 Photograph of joint tombstone of Charles Randolph Smith and Evelyn Bucek Smith, Forest Park Westheimer Cemetery, Houston, Texas. Copied from Find A Grave on 9/6/15. • His Find A Grave memorial, which includes pictures of his tombstones, is here. [S2] Holy Bible (1873) (date only) (omitting his surname). This bible was originally owned by J. M. Bartlett and Mollie Clopton and was in the possession of Ruby Lynn Shelton, Rice, Tex., when viewed by Roger Bartlett in 1974. [S58] Index to Texas Birth Records (Austin, Tex. : Tex. Dept. of Health, Bur. of Vital Statistics), typescript 1927, vol. 4, p. 1522, file 71953. [S961] Find A Grave, online at http://www.findagrave.com, memorial for Charles R. Smith, memorial no. 76304139, viewed on 6 Sep 2015 (giving the date but not the place). [S961] Find A Grave, online, above, memorial for Charles R. Smith, memorial no. 76304139, viewed on 6 Sep 2015 (not giving the date or place). [S961] Find A Grave, online, above, memorial for Evelyn Ann Bucek Smith, memorial no. 25891209, viewed on 6 Sep 2015 (not giving the date or place). [S961] Find A Grave, online, above, memorial for Charles R. Smith, memorial no. 76304139, viewed on 6 Sep 2015. [S961] Find A Grave, online, above, memorial for Charles R. Smith, memorial no. 76304139, viewed on 6 Sep 2015 (as to military service). Photograph of Evelyn Ann Bucek Smith, by Anonymous, copied from Find A Grave on 9/6/15. Other Names*: Evelyn Ann Bucek Smith, Evelyn Bucek Smith, Evelyn Ann Smith, Evelyn Smith. [S58] Index to Texas Birth Records (Austin, Tex. : Tex. Dept. of Health, Bur. of Vital Statistics), typescript 1928, vol. 1, p. 250, file 33208. [S961] Find A Grave, online at http://www.findagrave.com, memorial for Evelyn Ann Bucek Smith, memorial no. 25891209, viewed on 6 Sep 2015.